600 tweets a second. That might just jump up a little in the next 18 hours as the Deccabillitweeter will be crowned. What is a Deccabillitweeter? Well that is the person who will make the 10 Billionth Twitter. I know I will be trying for that. Therefore, you will see me tweet all day tomorrow. So what do you give a Deccabillitweeter? Well if it’s anything like an anniversary, it’s tin/aluminum or Diamond. So would that make it a Diamond-Deccabillitweeter? 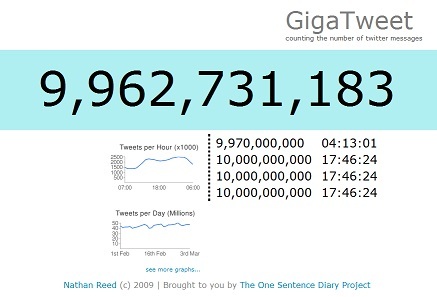 We have 18 hours to go, according to Gigatweet. Yep, it’s a site dedicated to watching how much time we waste online. Bless their souls.